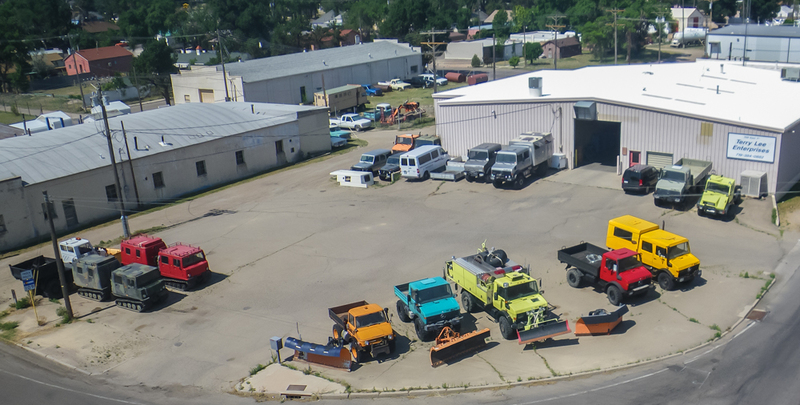 Aerial photograph of TLE's La Junta Facility showing some of our current vehicle inventory. Terry Lee Enterprises (TLE) based in La Junta, CO was founded in 1964. In 1996 it changed direction and focused on our passion for off roading and Unimogs. Interest in high-mobility vehicles has increased allowing TLE to flourish. TLE moved to its current expanded facilities in 2010 providing extensive under-roof space for maintenance, repair and customization of Unimog, Hagglunds, Pinzgauers and other off-road vehicles. TLE's owner, Rob Pickering, contracted with Unimog North America from 2003 to 2006 during which he received extensive specialist training on U-500 systems and operations. He continues support Mercedes Benz for their U-500 North American user base. Mr. Pickering has been active in the off-road community and has participated in numerous rock crawling events with high-customized Unimog and traveled both domestically and internationally with his own personal Unimog (see our photo gallery below). Additionally, he is a certified off-road trainer having received a certificate from I4WDTA in 2013. In addition to off-road operation, Mr. Pickering also operates Unimog in commercial applications including snow plowing, snow blowing, and recovery operations.